Please Help. Dutch Male and Female Porcelain Dolls. My father owned a thrift store of sorts and he would go to auctions, garage sales, estate sales and the like to fill his store. He passed away a few years ago and since money is tight now, I'm trying to figure out what some of the stuff is worth and try to sell as many items I can before we sell the shop. There is a shelf dedicated to porcelain dolls and most of which I looked on the back of the neck and couldn't find a makers name or anything but I did not check the entire body. 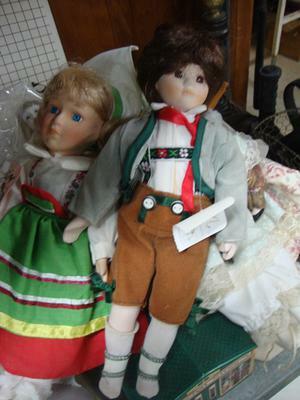 I have a picture of the 2 dutch dolls.I must admit I could have taken better picture but I didn't plan on posting this but since I could not find them on the internet I will try this. I can give more information when I go back to the shop tomorrow and also take better pictures. 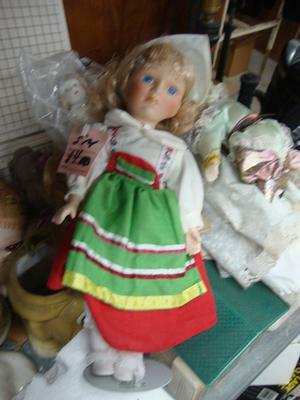 I also have picture of another doll but I think I have to post it by itself and not with these, right?